Diamonds for Dessert: Happy (belated) Birthday! 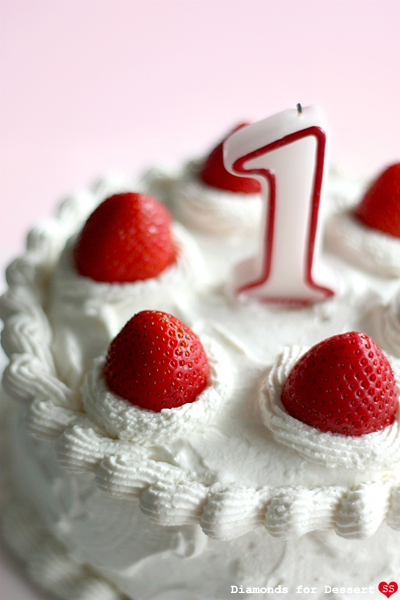 As of today, Diamonds for Dessert is officially 1 year (+ 12 days) old! Considering that my first baking post here was a few days before Halloween, it'd be impossible to actually celebrate Diamond for Dessert's birthday on the actual date (too much Halloween baking to do). 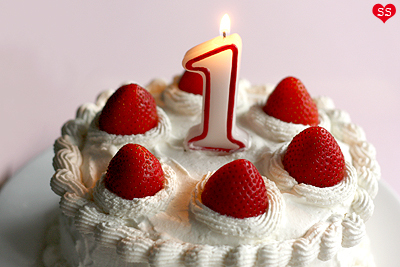 But I say, better late than never :D. Time for a celebration! 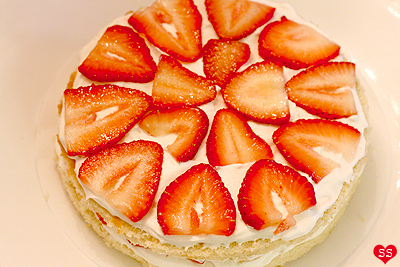 Today, I have a special recipe to share, a recipe for a wonderful strawberry cream cake. If you were to ask me what my favorite dessert EVER is, well, this is it. Really, if this weren't a birthday post, I'd name it "The Best Cake Ever." I've pretty much requested this cake from my mom for my own birthday every year since I was a little girl. 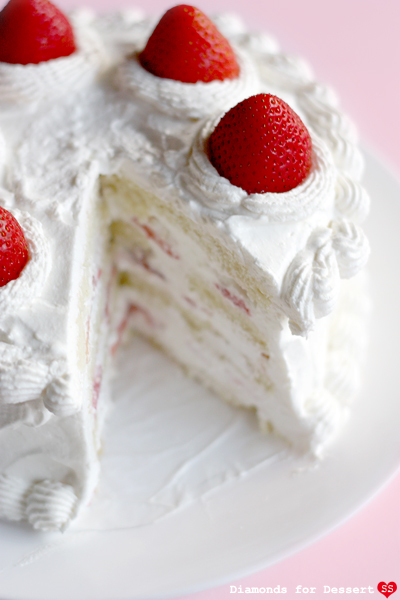 It seems like such a basic cake with lightly sweetened whipped cream, a few layers of chiffon cake, and fresh strawberries, but don't be deceived; it tastes amazing. I decided to take a no frills approach to decorate this cake, no fondant, no sprinkles, only a piping bag of freshly whipped cream to prevent any distraction from the taste. Even though it has only been a year since Diamonds for Dessert started, it feels like I've been blogging for much longer. Thank you to all of you out there who read my blog, new readers and old. Thanks to all of you who leave comments, from recipe questions to your results from trying these recipes; they really make my day. 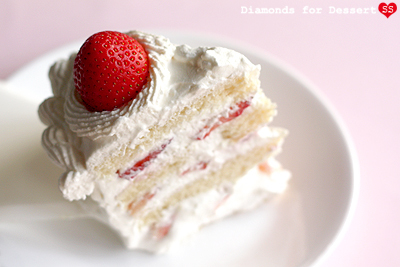 Happy Birthday Diamonds for Desserts; I hope for many more birthdays to come! P.S. The recipe really isn't that long, just lots of notes throughout. By the way, doesn't this totally look like a cake in a manga? Haha :P.
Cake: Preheat the oven to 350°F. Place the egg whites in a bowl and use an electric mixer to beat them until soft peaks begin to form. Once this happens, gradually add 1/2 cup sugar while mixing until stiff peaks form. Set aside. In another bowl, mix the egg yolks, vegetable oil, water, and vanilla together. Set aside. In another bowl, mix the dry ingredients: flour, baking powder, salt, and 1 cup sugar. Mix the egg yolk mixture with the dry ingredient mixture till smooth. Then gently fold in the egg white/sugar mixture. Gently pour the mixture into nonstick sprayed or parchment paper lined cake pans and smooth the tops. Bake the pans for around 25 minutes, or until a toothpick comes out clean and the top springs back when you press on it. Remove the cake from the pan and let cool on a wire rack. Strawberries: Wash and dry the strawberries. Cut off the leaf portion of the berries. Keep a few prettier strawberries to top the cake (I kept 6 for a 6-inch cake, so if you make an 8-inch cake, keep 8 berries) and set them aside for now. Take the rest of the berries and thinly slice them. Whipped Cream: Chill two large metal bowls and your beaters in the refrigerator for 15 minutes. Place the teaspoon of gelatin and tablespoon of water in a pan. Mix and let sit for 5 minutes. In the meantime, pour 1 cup of heavy whipping cream and 2 tbsp sugar in the chilled metal bowl. Beat on high power until you get soft peaks. Stop. Heat your pan of gelatin and water over low heat until it turns liquid and the gelatin is just dissolved in the water (it should be warm, not hot, if hot, let cool a little). Scrape this liquid into your whipped cream. Continue beating the cream until stiff peaks form. Then stop, cover this with plastic wrap and refrigerate. Next, in the other chilled bowl, add 1 cup of heavy cream with 2 T sugar. Beat on high until you get stiff peaks in the cream. This cream without gelatin will be used first when assembling the cake layers. Take your two cake rounds and cut them in half (parallel to the plane of the cake round) so you end up with four thinner cake rounds. Place one cake round on a round piece of parchment paper. Cover it with a layer of whipped cream. Add a layer of sliced strawberries. 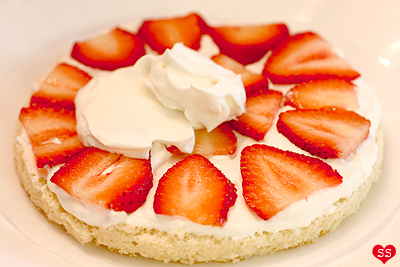 Cover the strawberries with another layer of whipped cream. 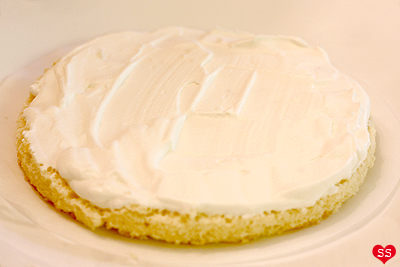 Place a cake round on top of the whipped cream. Repeat until you finish with putting the fourth cake round on top of a whipped cream layer. At this point, you can cover the cake with plastic wrap to refrigerate the cake to decorate later, or you can finish the cake. 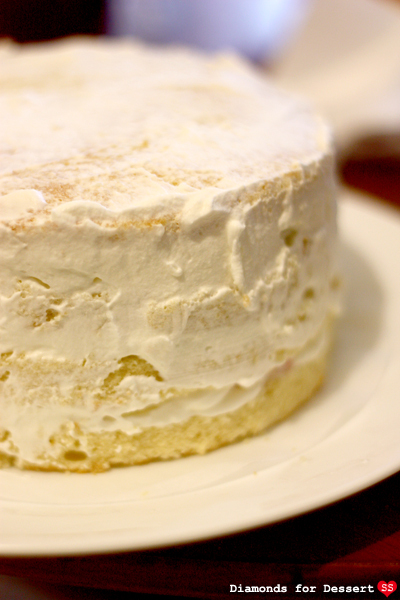 Next, to finish decorating, cover the entire cake with a thin layer of whipped cream to trap all the cake crumbs. 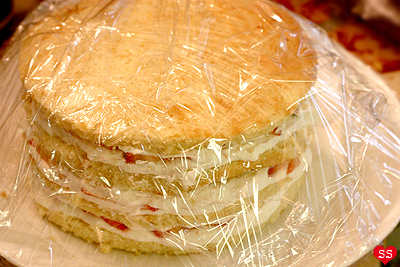 Then wipe off your spatula and cover the cake with a thicker layer of whipped cream so that no cake is showing through. Place a shell or star tip in a plastic piping bag and spoon the gelatin whipped cream into the bag. Pipe a border on the top and bottom edge of the cake. (If you've never done this before, like me before I decorated this cake, practice a little bit on a random piece of plastic wrap or plate. But don't worry, if you mess up, you can always scrape off the messed up part and redo it). Then, for a 6-inch cake, pipe six evenly spaced circles on the top of the cake, near the edge. For an 8-inch cake, pipe 8 circles. 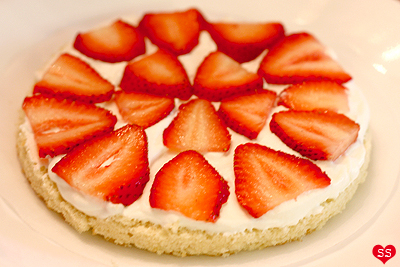 Finally, place a whole strawberry in the center of each piped circle and you're done. Serve or keep refrigerated until ready to serve. omfgosh, i'm so sad that i can't be there to eat this, cuz it looks sooo delicious! This looks similar to a cake I made for a previous birthday minus cream cheese. Gorgeous ethereal shots! This is one of my favorite cakes of all. Simplicity at its best. Steph: It was definitely a cake worthy of a celebration. eatingsumo: Thanks! Well, I think of baking as a stress reliever, so one of the first things I do after another round of midterms is bake cookies or cakes. Luckily it all works out. Xiaolu: Thank you. That sounds interesting. I remember when I was looking for a stabilized whipped cream recipe, cream cheese did pop up in a lot of them. I should try that out one day. hannah: Yay, I second that thought. glad you have good hobbies though! tiffany: Of course, a hobby that produces tasty treats, very practical :P.
Nancy: Yay! My mom decorates the cake with almond slices as well; they're good for making cute flowers on the cake. And indeed, it does taste pretty good like that. Sounds and looks wonderful! I'd like to dive into it and eat my way out :) Thank you for sharing the recipe and great photos. This looks delicious and I can see how it is your favorite! I would love to try this recipe for my son's 1st birthday at the end of the month. A quick question about the recipe though. Is the flour AP flour or cake flour?? Karin: Haha, thank you! No oven :O. But living in India sounds pretty cool :). Reiko: The flour is AP flour. Pretty much if I just list "flour" it means all purpose flour. this cake is beautiful. i love that it looks like a cake from a manga!! the cake looks beautiful and delicious. I want to try this cake out but i have few questions. Why are we not using baking soda in the dry ingredient mix? Secondly, on the last layer of the cake (top part) before icing it do we put the whipped cream with gelatin or without gelatin. Eva KH: Thanks! That sounds sweet. I'm glad it was successful! Anonymous: 1) Baking soda is basic so without acidic ingredients to neutralize it results in a bitter taste. Typically cakes use baking powder rather than baking soda b/c the ingredients are relatively nonacidic. Cookies, on the other hand, use baking soda more often. Baking powder is neutral, which means no bitterness :). 2) I only used the whipped cream with gelatin on the outside of the cake b/c I wanted it to hold the designs. If you're asking about the crumb coat, you can use either. can we use cool whip instead of whipping cream yourself? has anyone tried. if so how is the taste difference. I am a pretty good baker but never have whipped cream or whipped egg whites! nervous to do so. pearse: One of the main appeals of this cake is the freshly whipped cream. I personally think there's a huge difference between whipped cream and imitation whipped toppings such a cool whip. Not to say cool whip is bad; it's great for times when you just need a dollop of cream for garnish or for other quick projects. 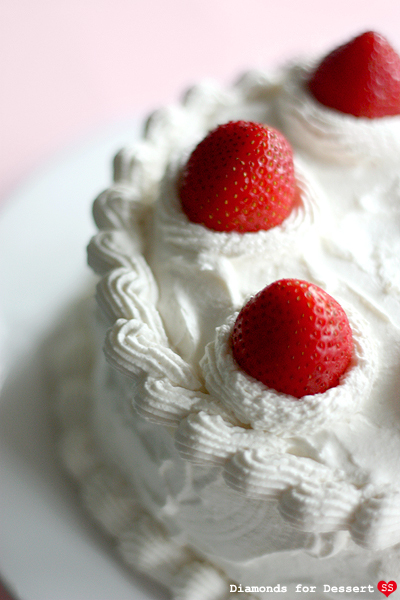 But for a cake, I'd take homemade whipped cream any day. Also, one thing I really like about whipping my own cream is that I can adjust how sweet I want the cream to be. By the way, if you've never whipped cream before, you should definitely definitely try it out. It isn't difficult at all; just a few minutes with an electric hand mixer and you're done. And, if you have any difficulties, there are plenty of videos online showing step-by-step how to whip cream and egg whites. 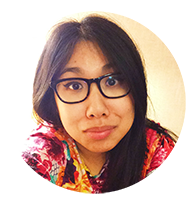 Hi, I'm a new follower, wanted to introduce myself. I think you have great yummy recipes. This cake look awesome. I have a baking blog myself. Feel free to stop by anytime. Yr cookies are soo very cute. Lurve them!! Pey: T = tablespoon & t = teaspoon. I've tried making it twice and whenever it comes out of the oven, it smells really eggy. Is that how it's supposed to smell? How many days does this stay fresh? Refrigerated? Sarah: Super late reply but thanks! Anonymous: I'm not too sure how really eggy smells. Well you are using 4-6 eggs in this recipe so I guess so? If it bothers you, you can add a bit more vanilla to mask the egg smell. Coopersmommy: The cake will taste good for a few days, but it won't look as pretty as the first day it was decorated because eventually the cream will start to loose its puffiness and fruit's juice will start running. I've made this cake many times, and it's one of my go to recipes. I absolutely love how it's turned out every time. I was reading the comments the other night just for fun. I ran into the one that talked about the eggy smell of the cake. I could not understand for i made the cake so many times and never before had it been eggy, but today, i took the cupcakes (as i made cupcakes instead of a cake) and i tried one and it was EGGY!!! I popped them in for another 5 min. and that seemed to get rid of it, but a slight egg taste is still lingering in them. :( I hope this is a one time thing!! But other than this one time, this recipe is awesome!! This is a definite YES on my things to make list! Thanks for the recipe! I love this recipe!! Could you try a recipe for a basil cake that can also be used as a cupcake recipe?? I can't seem to find a good one. Thanks!! 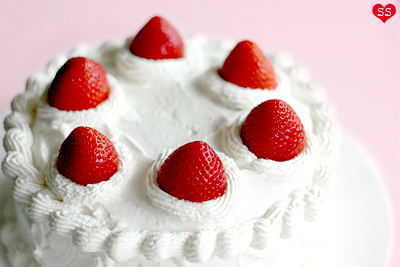 That strawberry cake with whipped cream is really looking so yummy and appealing...just can't resist to prepare this following your recipe indeed...Great one!! What kind of flour? AP? Cake?